An affiliate of Abbey Caskets, CareNotes provides a large selection of booklets dealing with grieving, bereavement and other topics. Compassion Books provide a large selection of books to help cope with serious illness, death, grief and breavement. Funeral Consumers Alliance is a nonprofit organization dedicated to protecting consumer’s right to choose a meaningful, dignified, affordable funeral. Federal Trade Commission site with information and downloadable guides about consumer rights under the Funeral Rule. Saint Meinrad Archabbey Gift Shop offers grief and memorial products for those who have lost a loved one. 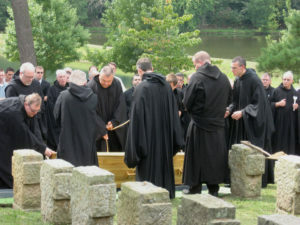 A monk being buried in an Abbey Casket in the Saint Meinrad Archabbey cemetery.